Heat the oven to 400°F. Line 2 baking sheets with parchment paper. Finely grate 2 teaspoons zest from the orange. Heat the butter in a 12-inch skillet over medium-high heat. Add the apples and cranberries and cook for 6 minutes or until the apples are tender-crisp, stirring occasionally. Season with the salt. Stir in the sugar and cinnamon and cook for 1 minute. Remove the skillet from the heat. Stir in the walnuts and orange zest. Let the mixture cool for 30 minutes. Sprinkle the flour on the work surface. Unfold 1 pastry sheet on the work surface. Roll the pastry sheet into a 12-inch square. Cut the pastry into 12 (4x3-inch) rectangles. Repeat with the remaining pastry sheet. Place about 1 1/2 teaspoons white chocolate chips in the center of each pastry rectangle. Top each with about 1 tablespoon apple mixture. Brush two opposite corners of each pastry with water. Pull one corner up over the filling. Pull the opposite corner up over the filling and tuck it under the pastry, enclosing most of the filling but leaving the ends open. Place the filled pastries on the baking sheets. Heat the remaining white chocolate chips in a double boiler until melted and smooth, stirring occasionally. Drizzle the white chocolate over the pastries. 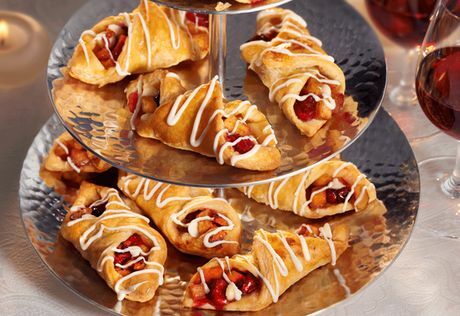 Flavor Variation: To serve these pastries as a gourmet appetizer, omit the white chocolate and substitute 1 large sweet potato, peeled and diced, for the apples.